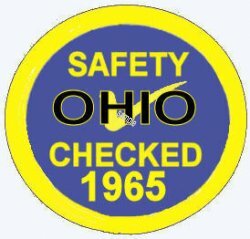 1965 Ohio Inspection Sticker - $20.00 : Bob Hoyts Classic Inspection Stickers, Add a Final Touch to your Restoration! We do not know if Ohio ever had a statewide inspection program before 1966. This sticker proves there was some sort of inspection then. This 1965 sticker was used in roadside spot checks and by car dealers. This 1965 Ohio sticker was carefully restored both front and back from a very nice original. Many thanks to Jim Zoc, Rayland Ohio for the original image.